I love Jandy Nelson. I first became a fan of hers when I was given "The Sky is Everywhere" as a gift. If you have not read that book, you need to stop reading this immediately and go get it. It's the kind of book you dream of. 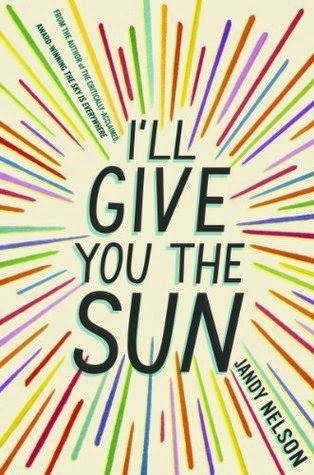 Now, on to "I'll Give You the Sun". I have to admit before I read this I spent a lot of time online reading reviews of this book. I gotta tell you some readers and reviewers that I really admire DID NOT LIKE THIS BOOK. I usually don't take things like that so personal but it did make me a little wary. I mean, it was Jandy EFFIN Nelson. It's not often but every once in a while I will run into an author that I really love and I only end up loving some of their books. AND that is totally OK. However, I forged ahead insistent that I read it for myself. I will say that there is something very poetic about Nelson's writing style. Something, that I love but also is the problem that others have in liking her work. They think she is too metaphorical or wordy. I love how lyrical her writing is and I fall in love with the pages. I don't want to give too much of the plot away but I do want to actually tell you what the book is about. Noah and Jude are twins, brother and sister twins. The novel is told by each of the twins and it spans over a number of years, these are very long chapters. Noah starts the story off and then Jude fills in the rest. When we meet Noah he is a young boy struggling with his sexual identity and Jude is a young girl who has sworn off boys forever. This part sounds like a somewhat typical YA contemporary novel. However, you have no idea just how much of an emotional roller-coaster you are in for. This story will rock you to your core. It will make you laugh and cry. I was brimming with disgust and anger at times and I had to physically take a break away from it. The amount of pain the twins inflict on each other and the tragedy that the family suffers will shock you. However, you won't stop reading. You will be hypnotized not only by the lyrical writing but the story and the characters that you have come to know so well. This book will break your heart. Does that mean, I am sad I read it? Hell no. I am so glad that I got to know this story. I AM NOT the same person I was before this book. It has burrowed its way into my soul. Jandy Nelson is a force to be reckoned with and at this moment, after this book I can't think of anyone I would rather read.